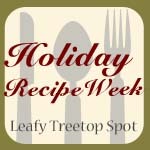 Link up your favorite Holiday Recipes here. For me, there's nothing like whipping up a plate of candies or cookies to put me in the holiday spirit. Making a special holiday treat is a great way to show your neighbors, coworkers, and loved ones that you care. Find your favorite recipe, whip up a batch, take some photos, post it on your blog, and link up your recipe to this recipe only link party. Don't forget to grab a button from the side bar, so that other's can have a delicious holiday season as well.